Manchester United fans have reacted emotionally to Cristiano Ronaldo’s return to Old Trafford after the Champions League draw. 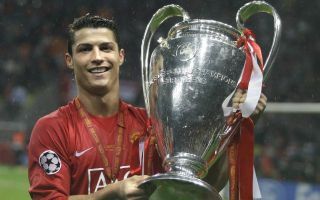 The Red Devils have been matched with Juventus in their group, meaning Ronaldo is set to return to United for just the second time since he left the club in 2009. The last time Ronaldo played against his old side in the Champions League, he scored in both legs as Real Madrid knocked them out at the last-16 stage in the 2012/13 season. United will hope this time can be better as Ronaldo is no longer quite at his peak, but for now the fans seem mostly just happy to see the Portugal international back in Manchester. The 33-year-old remains much loved by United supporters after a superb career with them between 2003 and 2009, during which he won three Premier League titles, the Champions League and other honours. He’s arguably only improved since then, and United will need to be on their toes and not too overly emotional on the night when their former hero returns to the Theatre of Dreams once more. Ronaldo is going home ? Ronaldo's coming back to OT ?